Flood Brothers Disposal presents The Skinny and Houli show and we start off this week with a brief conversation about the Olympic Games. Our first guests this week are President of The Chicagoland Sports Hall of Fame, Charlie Carey, Lori Healey from McCormick Place and Packers Veteran and NFL great, Frank Winters. These three have come to tell us about the awards night on September 7th at McCormick Place. Charlie tells us about how he got started with the Hall of Fame 20 years ago. Lori was recently named the 10th most powerful woman in Chicago and she tells us about the new developments at McCormick Place. And Frank will be receiving the George Connor Award at that awards night on the 7th. Proceeds will go towards helping underprivileged kids receive school scholarships. More details can be found at chicagolandsportshalloffame.com. Our next guest is Chief Mike Miller from the Chicago Fire Department. Mike is going to Ireland with our hosts in October and they look back over the antics that went on during their past trips together. Our third guests are Mary Dunne and her granddaughter, Caitlin. The guys chat with these ladies about college and Mary’s experience on the Skinny and Houli annual trip to Ireland. 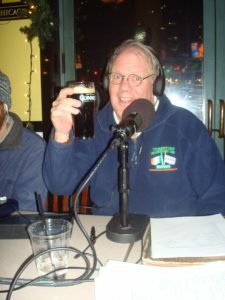 Our final guests this week are Mike “Pickle” Joyce and Marty Malarkey. Pickle fills us in on how the Celtic Boxing Club is doing and he tells us a little about his father-in-law, Muhammed Ali, and his funeral. Marty has been concierge at McCormick Place for 17 years and he tells us a little about his Irish heritage. We hear about the upcoming events and as always, we have our ‘Who Cares?’ and ‘Who Died?’ segments. A jam-packed show for you listeners this week with amazing guests!